Dolutegravir-based treatment was no more effective than treatment based on a 400mg dose of efavirenz, a randomised trial conducted in Cameroon has found. 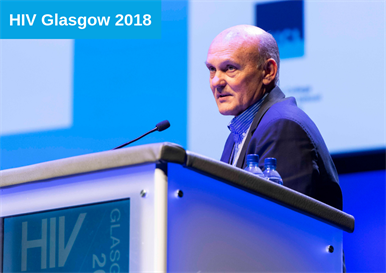 However, almost half of people with very high viral loads taking either regimen had a detectable viral load after 48 weeks, the International Congress on Drug Therapy in HIV Infection (HIV Glasgow 2018) conference heard. Dolutegravir plus tenofovir and lamivudine is recommended as the preferred regimen for first-line antiretroviral treatment in low- and middle-income settings by the World Health Organization in guidance issued in July 2018. This guidance recommended that dolutegravir should be used with reliable and consistent contraception by women of childbearing potential and that efavirenz 600mg could be used as an alternative, including when reliable contraception is not available. Lowering the dose of efavirenz has benefits in terms of side-effects and cost. The ENCORE 1 study showed that efavirenz 400mg was non-inferior to efavirenz 600mg but resulted in fewer side-effects. Efavirenz 400mg was recommended as an alternative option for first-line treatment by the World Health Organization in 2016 but there has been no head-to-head comparison with dolutegravir. This leaves national treatment programmes with a dilemma, for dolutegravir has been shown to be superior to efavirenz 600mg. The NAMSAL ANRS 12313 study was conducted in Cameroon, where there is a high background rate of transmitted drug resistance, chiefly to non-nucleoside reverse trancriptase inhibitors and nucleoside reverse trancriptase inhibitors. The study was designed to test the non-inferiority and superiority of the regimen of efavirenz 400mg compared to dolutegravir. The study randomised 616 adults. Two-thirds of the study population were women, with median age of 36 years and a median CD4 cell count of 281 cells/mm3. Two-thirds of study participants had a high viral load (above 100,000 copies/ml), 30.5% had a viral load above 500,000 copies/ml and the median viral load in the study population was 5.3 log10 copies/ml. After 48 weeks on treatment there was no significant difference in the proportion of participants in each arm who had a viral load below 50 copies/ml (74.5% in the dolutegravir arm and 69% in the efavirenz arm). No significant difference in viral suppression between the regimens was observed at week 48 at any viral load stratum (< 100,000 copies/ml, > 100,000 copies/ml or > 500,000 copies/ml) but the study did find that both regimens were less effective at higher viral load levels. In participants with baseline viral loads above 100,000 copies, 66.2% of the dolutegravir group and 61.5% of the efavirenz 400mg group had a viral load below 50 copies/ml at week 48. In participants with baseline viral loads above 500,000 copies/ml, 54.8% of the dolutegravir group and 57.9% of the efavirenz 400mg group had a viral load below 50 copies/ml. Of those with viral load above 50 copies/ml, there was no difference between the study arms in the proportions with viral loads in the range 50-200 copies/ml or 200-1000 copies/ml. Nineteen participants had viral loads above 1000 copies/ml (16 in the efavirenz arm and 3 in the dolutegravir arm) and so could be tested for drug resistance mutations. None of those who experienced virologic failure on dolutegravir showed any evidence of drug resistance mutations but nine people who received efavirenz 400mg developed drug resistance, in three cases to all the drugs in the regimen. No significant difference in adverse events was found between the two arms (11% in the dolutegravir arm and 8% in the efavirenz 400mg arm). Eric Delaporte of the University of Montpellier said that the findings supported the use of dolutegravir as a preferred first-line regimen, to preserve future treatment options. Efavirenz 400mg should be used as an alternative only where viral load monitoring is available, and the threshold for virological failure on this regimen should be set lower than the current level recommended by the World Health Organization for lower-income countries (1000 copies/ml), to reduce the risk of developing drug resistance. Professor Anton Pozniak of the Chelsea and Westminster Hospital, London, commented that it was concerning to see the low rate of viral suppression achieved in people with viral loads above 500,000 copies/ml in the study. “Are we seeing this because it’s the first time we have seen data on such a large population?” he asked. Cournil A et al. Dolutegravir- versus an efavirenz 400mg-based regimen for the initial treatment of HIV-infected patients in Cameroon: 48-week efficacy results of the NAMSAL ANRS 12313 trial. International Congress on Drug Therapy in HIV Infection (HIV Glasgow), Glasgow, UK, abstract 0342.